Walk Out Your Cottage and on to Your Boat! Lovely summer cottage on Venetian Harbor with a dock. Located in prestigious Groton Long Point. Newly refurbished with all amenities. Minutes away from Historic Mystic, Mystic Seaport, New England Aquarium, the casinos, golf, tennis courts on site with 2 private beaches, A tremendous family private beach community. Open your eyes in the morning to the view of the beach and your own boat sitting at your dock. You can walk down the street to the yacht club, enjoy breakfast and a copy of the newspaper (the yacht club also serves sandwiches and ice cream all day long). You will see children pass by with tennis rackets and life preservers and bathing suits ready to start the day of organized activities. The atmosphere is congenial and friendly. You might take a few more steps to Main Beach in this private beach community. In the evening you might find yourself preparing for the 'Hello Summer' cocktail party or Family Night at the yacht Club followed by fireworks. You might be riding into Mystic for dinner whether it be Mystic pizza for the family or a more elegant fair for the adults. Area attractions include, Mystic Seaport Museum, New England Aquarium, U.S. Naval submarine base with the submarine museum, Ocean Beach Amusement Park, the casinos, antique shops of Stonington, the wineries of the Connecticut Wine Trail, O'Neill Summer Theater, The Pequot Indian Museum and a short walk to Esker Point Beach for free Thursday night concerts on the beach. I am an orthodontist and a single dad. I love my jobs! I have two boys. We enjoy hanging out together. We boat, fish, sail, jetski, play tennis and golf together. Summers are really special for us. I wish I had come to this property years ago. It is truly unique. The best way I can describe Groton Long Point is that it is the closest thing to a giant summer camp for children and adults. There are a plethora of activities e.g. instuction for sailing, swimming, tennis, golf and all kinds of sports! There are cocktail parties, family night followed by fireworks, a Fourth of July parade and other organized social events through the yacht club thoughout the summer. It is a wonderful and fun place to be. This is a wonderful place for families. This is newly refurbished but still retains a cozy feel. It is full air conditioned with flat pannel TVs in all the rooms. It has a wonderful expansive deck that sits 5 feet from the water. The cottage has just been recently remodeled and refurbished. It abuts Venetian Harbor with a large dock literally 3 steps off the back deck! Not only are there great views of the harbor but also the ocean and a Seaflower Light! You can watch the sunsets right from the large deck, living room, upstairs bedroom and deck as well as the master bedroom. Looking out the living window, you can see can see Sea Flower light in Fishers Island Sound across the harbor. Then house sits right on Venetian Harbor. 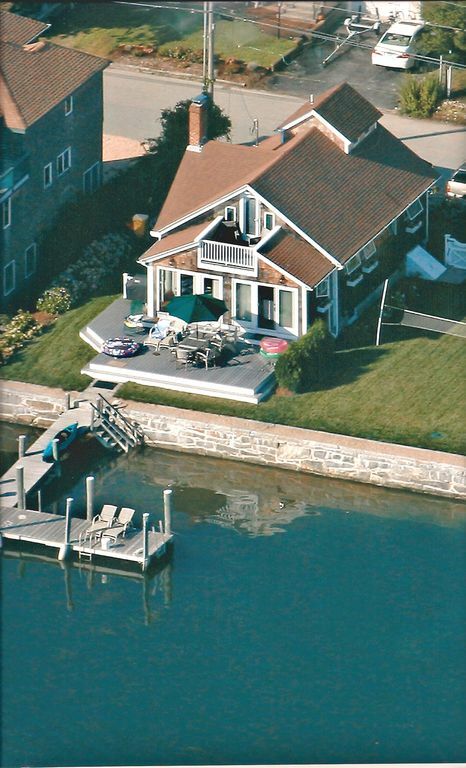 The cottage sits 30 feet away from venetian harbor. 5 steps off of the back deck and you are on the dock behind the home! Open your eyes in the morning to the view your own boat sitting at your dock. You can walk down the street to the yacht club, enjoy breakfast and a copy of the newspaper (the yacht club also serves sandwiches and ice cream all day long). You will see children pass by with tennis rackets and life preservers and bathing suits ready to start the day of organized activities. The atmosphere is congenial and friendly. You might take a few more steps to Main Beach in this private beach community.